I have gotten a lot out of this journey, met some amazing blokes who I will be mates with for life. Before the trek I could not even sleep, just toss and turn with thoughts what have I gotten into, how did my life get so f…d up. Should I just bail and go the lone wolf and stop inflicting my family with this CURSE.I was told the drive was 3 hours by Dave which probably helped me get there. So it was six but what the f..k you’re here anyway go for the ride, that’s three hours less counselling. It was really good having Craig and Mick on the trek because they really understand as they have been there as well. A penny for our thoughts and I got quite choked up because I was upset that the time was coming when I was going to have to say goodbye to these amazing blokes. They have been so supportive and actually understand what I am going through. I can actually talk to blokes who I can open up to and trust, this stuff is just priceless. I think it has already made such a big impact on my life and I’m so grateful to be able to call every one of these blokes my mate, both trekkers and staff. I feel like I belong, like somehow I am meant to be here, this is my moment, my time. My choice to fix me. Being on this program and surrounded by others who are in similar boot, I hope to gain the tools or at least begin to. If I wasn’t here, I know I would not live to see Xmas. These blokes call themselves farmers, over the past 3 days they have only planted the seeds but the fu…rs have started to germinate. 1. 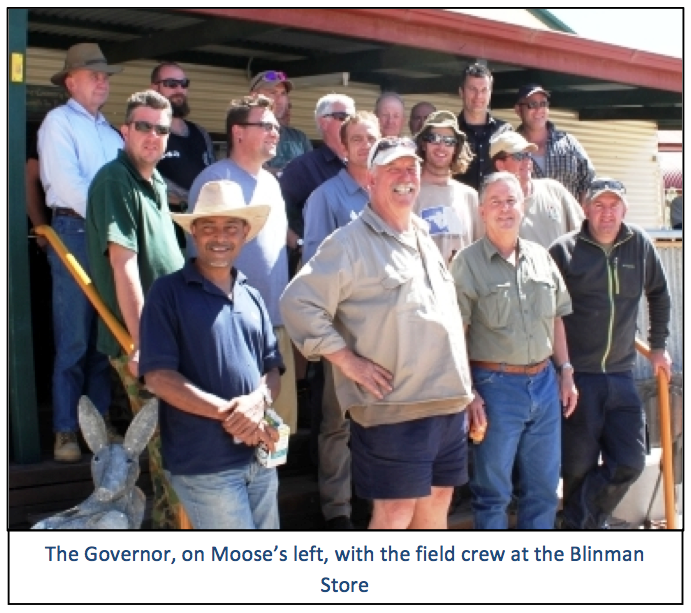 Trojan’s Trek is a program which was first run in the North Flinders Ranges of SA in the late 1990s to assist troubled Vietnam veterans on their return post deployment. In 2008, the idea was resurrected to cater for younger veterans who were facing the same issues. 2. The 2013 trek, conducted from 22 to 27 September, was the fifth in this series which targets contemporary veterans from conflicts following the Vietnam War. To date male only treks have been conducted. This is not because of gender bias and efforts are being made to identify a female group. The problems resulting from military induced stress illness (MISI) is experienced by both genders. 3. 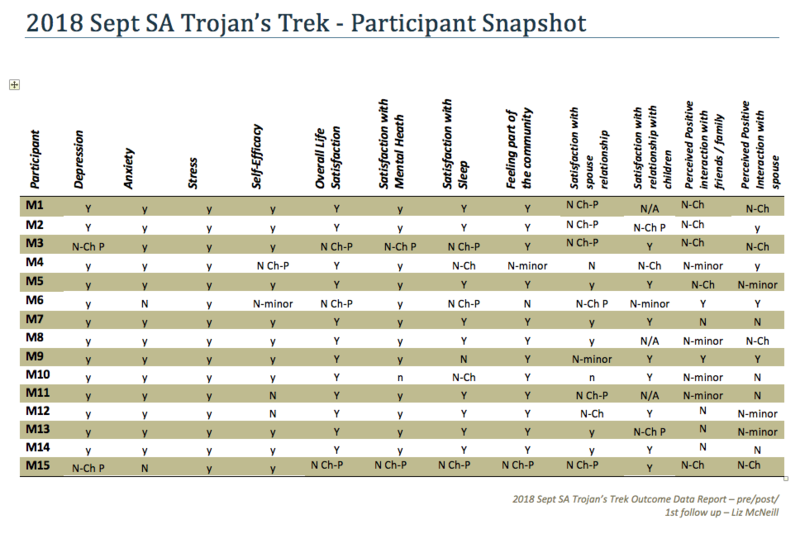 The aim of Trojan’s Trek 2013 is to provide a setting and conditions under which participants experience a lasting positive shift in personal values and interpersonal relationships. 4. The objectives of the trek are to assist the participants, through group and individual challenge, achieve an awareness of the following: • an understanding of how thoughts and feelings influence behaviour, • exposure to various strategies which will bring about positive change, • individual responses which are effective in achieving goals, • improving interpersonal relationships, and • enhancing self-esteem. 5. 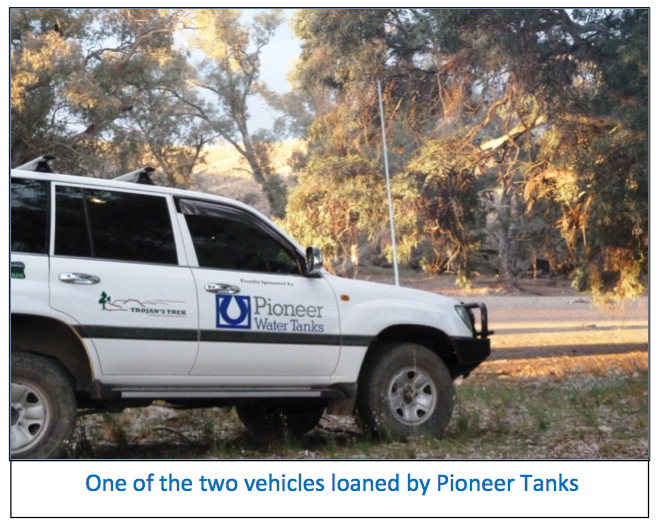 The 2013 project was funded by a number of individuals and agencies. The majority of the funding was provided by Health SA with the State RSL and the QLD RAR Battalion Associations contributing. The efforts of Ted Chitham MC, QLD RAR contact and Christine Jenner, RSL SA are acknowledged. The SA Government funding will cease this year and the Board wishes to acknowledge this timely assistance. In the future funding will clearly present a challenge for a small organization such as Trojan’s Trek. 6. In order to justify the program’s claims to successful outcomes, four standard psychosocial instruments have been administered since trek one. 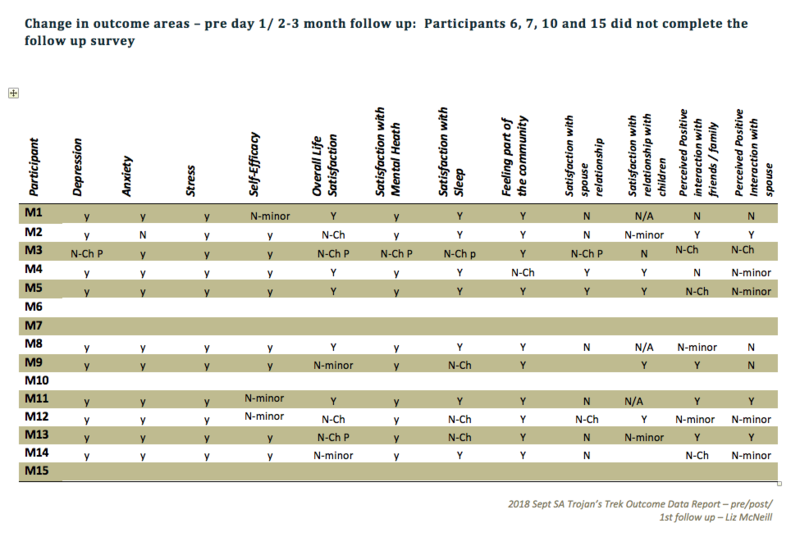 They are: • Life Satisfaction Scale (Hilda) for comparison with Australian normative data, • Positive and Negative Interactions, for comparison with ACPMH Longitudinal Research, • General Perceived Self Efficacy Scale, for comparison with VVCS programs for newly discharged members of the ADF, and • Audit & DASS 21, for comparison with VVCS clients. 2. 7. These are completed on three occasions: • prior to the commencement of the trek, • Immediately following the completion of the trek, and • two to three months later. 8. A master’s student in clinical psychology from Uni SA has recently completed a study to independently evaluate the data collected as part of her ongoing study. Her thesis has been completed and the findings which set a new benchmark in peer support outcomes, will be released at the Australasian Military Medicine Conference in Adelaide in November. 9. Many of the participants lack self-confidence and are low in self-esteem. It is therefore difficult to gain an early commitment to take part in an activity which is conducted a long way from home and from which withdrawal is difficult once commenced. In addition, because participants will probably be unknown to each other, the course of least resistance is failure to attend. As in previous years final numbers were the cause of some concern as one of the base tenets of involvement is that the participants must volunteer to attend. No pressure is placed on any of those who wish to be involved. Although it would be advantageous to secure referrals from medical specialists and others, participants are self-identified as no other means is readily available without contravening patient confidentiality. 10. The impact of the trek is powerful and positive. The result in almost 100% of those who attend is a positive change to their life and impacts on those around them. There are no costs for those attending, the effort is minimal and the benefits substantial in many aspects. Certainly there would appear to be nothing to lose, even from a biased point of view. Word of mouth from previous trekkers is now the main source of referrals and accounted for over 60% of those attending. Personal calls to a number of those expressing interest was necessary to confirm attendance. During the trek some of those contacted stated that had it not been for the personal contact from a mate or a staff member, they would not have been involved. 11. Details of the 2013 participants are listed below. 12. Of the 9 participants: • one was currently serving as a member of the Defence Force, • seven were from interstate, • eight were army, • two had been injured on operations • one was a VIC AMB employee suffering PTSD. Note: Two mentors attended this trek, both having been participants on previous treks. 3. 13. As previously indicated, participants are self-nominating. However, it is important to gain approval from their treating doctor to avoid including individuals with the potential for self-harm or pose a danger to the staff. This was achieved as part of the nomination process by the submission of a form signed by the participant’s doctor. Note. For all except the arrival and departure nights, the participants and field staff including the Director spent four days and three nights in the bush. The staff numbers were satisfactory and the response to mentors was positive. 15. a. H.E. Rear Admiral Kevin Scarce AC CSC RANR and two staff members. The Governor remained with the trekkers for approximately 20 hours, staying in the bush overnight. His attendance was appreciated by the staff and trekkers. During his stay he spoke to each of the participants about their individual problems and the outcomes they were seeking. Their journals reflect an appreciation of his personal interest. b. Steve Cannane and Brant Cummings from ABC TV. Steve and the cameraman remained with the group for approximately two and a half days during which time material for an ABC TV program called Lateline was captured. It is anticipated the program will go to air in November. Concerns regarding not only the visitors’ presence but that of a TV camera were quickly forgotten. Filming and questioning was handled sensitively by the team who were well versed in the individuals’ issues. 4. 17. The insurance excess which applies to hire vehicles in the case of accident remains a matter of concern. A payment of $33.00 per day per vehicle is required to reduce the excess to the minimum. This results in an excess reduction to $2,500.00 (single vehicle) and $550.00 (multiple vehicles). No claims were necessary. 18. For this trek it was necessary to purchase a new covered dust-proof trailer and five extra swags. In previous years, we have used a covered trailer which was either hired or donated. These options both carried a sting in the tail; the hire trailer cost was $380 and the borrowed trailer was in very poor condition, not worthy of rebuild. The additional swags were required for members who would otherwise not have had access to them. 19. A briefing for the participants and their partners was held on 20 September at the RAR club in Linden Park. Partners were invited as past experience has shown that it is an advantage if the partners have some understanding of the veteran’s condition and the objectives of the trip. Interstate partners were not able to attend. Nonetheless, for those who did attend it was a valuable session. The Director of VVCS was invited but was unable to be present. 20. 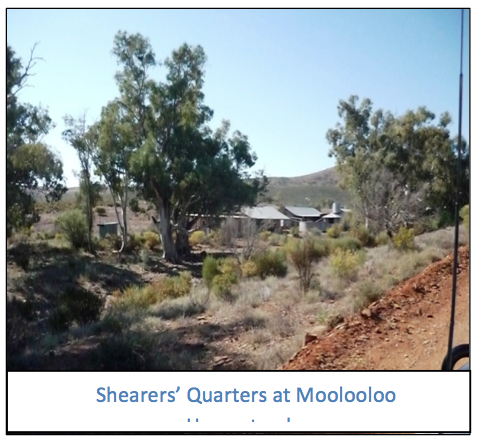 The trek established a base at Moolooloo HS Shearers’ Quarters which is 42 km NE of Parachilna on the Glass Gorge Road. The station occupies approximately 540 square miles of country which varies in type and relief from east to west. The distance to the area of the trek is approximately 520 km. Travelling these distances is time consuming and expensive in fuel, but the advantages in having no mobile telephone, television or radio reception more than offset the disadvantages of travel. A trip of this duration also permits the participants to get to know each other en-route. The feedback on the location from the participants is positive. 5. 21. A press release prior to the trek was issued although only one country radio station made enquiries. 22. The use of journals has proved to be an important element for participants. They are used to record personal responses to the various lessons and to make general comment on the trek. A specific time was set aside each day to permit the completion of the journals. This proved to be satisfactory from the point of view of better quality comment and also provided the opportunity to collectively review and anchor the day’s lessons. Although these comments are qualitative they do represent the perceptions of the participants at the time and are not always strictly in accord with the quantitative measurements gained via the psychosocial instruments listed at paragraph 6. This aspect of differing evidence values was one of the criticisms raised in the ACPMH Report of 2010 and although it would be ideal if the qualitative and quantitative results match perfectly, the perceptions and subsequent behavior of the participants are paramount in gauging the success of the program. 23. The messages which are conveyed during the trek are common to a number of Cognitive Behaviour Therapy (CBT) sessions, but the method of delivery combined with the surroundings make the message much more powerful. There is no doubt that the live-in nature of the trek shared with other veterans is a significant factor in the success of the program. 24. On the last evening, a staff debrief was held in order to capture the immediate thoughts of the staff. No major issues were raised apart from the difficulty in attracting participants. 25. On the last night of the trek a ’tick and flick’ survey was issued and completed by the participants. The questions were aimed at an immediate response to the trek and were primarily designed to gauge how the course was conducted as well as an opportunity to comment on the content. One of the conditions not included for comment was the rule that the trek is ‘dry’ or alcohol free. This was non-negotiable and therefore not up for comment. However the general consensus was that this is a good idea. This indicates a favourable result in content and presentation. 26. A telephone was connected to the shearers’ quarters from which normal telephone and internet services could be accessed. While in the field, UHF CB hand held and vehicle mounted radios were used for communications on simplex. Duplex on Channel 3 is also available for contact at greater distances. Mobile telephones do not operate north of Hawker which is approximately 88 km south of Moolooloo HS. This year one of the previous trekkers, through the generosity of BTW Communications Penrith, donated 6 UHF radios with ancillary equipment. This avoided a hire and reprogramming fee. 27. First line medical support was provided by an ex-defence force member who is now with the Victorian Ambulance service as a Para-medic. In addition, a doctor was on hand as a staff member and a number of other staff are qualified as senior first aiders. The longest exposure to the most serious risk was assessed as traffic accidents during the trip to and from Moolooloo. No medical or psychiatric issues arose. 28. The weather was fine but very windy on two nights with gusts to 45 knots. Temperature ranges were from 9 to 30˚C. 29. The delivery of the program was the joint responsibility of the Chief Instructor Robert Kearney and civilian consultants Peter Keith and Andrew Badenoch. Their credibility and insight made for interesting and varied sessions which carry a common message presented in a unique way in a different environment. This trek was utilized to provide training for others who will be part of the succession plan. 30. In the opinion of the participants, the lessons and program outcomes appear to be more effective when delivered by a veteran as opposed to a counsellor in consulting rooms. This is completely in accord with the philosophy on which the trek is based; that is older veterans helping younger veterans. In other words, the tribal elders provide advice and encouragement to the young. This approach has been adopted over many thousands of years by other civilizations and in today’s society is adopted by alcoholics and gamblers. 31. The tenor of the week is relaxed yet highly focused on outcomes. This comes as a surprise to most of the participants whose expectations are for a course run along military lines. This is the antithesis of the practice. 32. The inclusion of two civilian experts provides a balance to the military presence. They deliver sessions linked to their expertise and are skilled in providing advice and encouragement in a form which is perceived differently to that provided by the veterans. The balance is fine but necessary to gain the confidence of the attendees. Both these members have been instrumental in providing follow-up advice which in a number of cases has resulted in job placement. The gains from their inclusion are manifold. 33. This aspect of the experience is important if the impact of the trek is to be maximized. It also would be beneficial if an organization with greater resources could become actively involved in follow-up. d. development of an achievable business plan to support the Foundation’s objectives. 35. There is no doubt that the isolation and the live-in nature of the trek are powerful catalysts in conveying opinions and promoting disarming honest comment from all concerned. Sustained by the opinion of strong anecdotal evidence, the trek was an outstanding success. However, the realization that behavior affects relationships and behavior modification may offer an answer to an unsatisfactory personal life is just the start. In the opinions of the participants, they have universally achieved a number of goals and leave equipped to face the challenge. By their own admission, not only have they faced and discussed their problems frankly among the other participants and staff, many have formed relationships which are based on personal and common problems. 36. For some this is the commencement of a long journey and understanding and further help will assist in their arriving at a better place. The real test will be to carry the determination into each individual domain and anchor that in their lives. It is desirable that participants form a mental strong point to which they can retreat before consolidation and continuation. It is this aspect of the total picture which requires much greater external support and follow-up from existing supporting networks. 37. One of the discoveries which more than half of the group became aware of was that they and their families have lived through personal problems thinking they were alone in their pain and frustration. All of the participants exchanged email addresses and intend to maintain contact and provide advice and assistance to each other. This internal bonding is proving most valuable in their respective journeys. Instigated by a participant, a Facebook page has been established for the group and selected staff. 38. Both the participants and staff believe that there is an ongoing role for programs of this nature for veterans. The principles may also be applied to other vocations. The trek may not suit every veteran but it is a valuable and effective adjunct to one on one counselling and pharmacology. 39. Further information about the foundation is available on the web site at www.trojanstrek.com. The first of the following three SMS from came out of the blue from a 2010 trekker. The latter two were sent following my follow up encouragement and enquiries in an effort to identify the specific source of his benefit. “Yeh no problems mate. The Dogs Bible was easy very to understand. Using like the geese, squirrel, beaver. Touch on Mentoring, The Box of Life. The isolation of the Flinders with other veterans was a real journey in my mind. I opened up to a degree with some members, it was the very first step in kicking the stigma of PTSD. I still keep to myself with civvie friends but feel free to talk about it with other veterans now. The biggest hurdle was anger within myself, so much anxiety. It became a relief that my shrink has given me ssri medication (Lexapro) to stem the anxiety that comes with intrusive thoughts and the continual feeling of being on edge, (always looking for cover etc). This combined with my time in the Flinders is a Godsend. I can remember loosing that anger feeling in me at the Flinders but becoming a blubbering mess of emotion. But the pressure of life in the fast lane and the civilian priorities just bring on anxiety that is very hard to control.